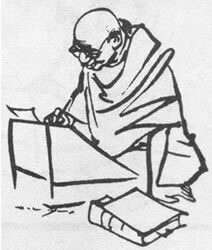 A collection of Mahatma Gandhi letters. What A Boy Can Do? See that God is to be found within, no research in physical science can give one a living faith In the Divine. Some have undoubtedly been helped even by physical science, but these are to be counted on one’s fingertips. My suggestion therefore to you is not to argue about the existence of Divinity, just as you do not argue about your existence, but simply assume like Euclid’s axioms that God is, if only because innumerable teachers left their evidence, and what is more, their lives are unimpeachable evidence. And then as evidence of your own faith, repeat Ramanama every morning and every evening at least for a quarter of an hour each time, and saturate yourself with Ramayan reading.